Kurtuluş Son Durak is a busy intersection and transit hub that’s a hive of activity 24 hours a day. Marking a transition between the tidy, middle-class Kurtuluş neighborhood and the rough-and-tumble quarters of Dolapdere and Hacıahmet, the area is home to a host of eateries and cafes that never seem to close. Right in the center of it all, we stumbled across a diminutive white van rigged with a makeshift grill. 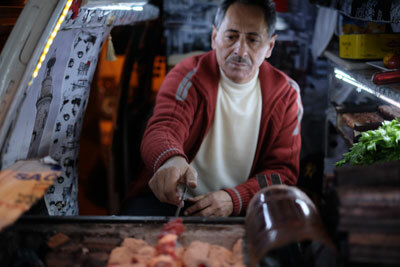 Inside the tiny, elaborately decorated vehicle crouched Yıldırım Usta, a 75-year-old veteran of the kebab trade who has been serving up truly delicious dürüm – kebab wrapped up in flatbread – on Kurtuluş Son Durak for 28 years. He has lived in the area for just under half a century. “You see all these other kebab shops? I was here before all of them,” he told us. It is no surprise that Yıldırım Usta adheres to a system that hinges on absolute quality and freshness, and embodies the term usta, master, to the fullest extent.